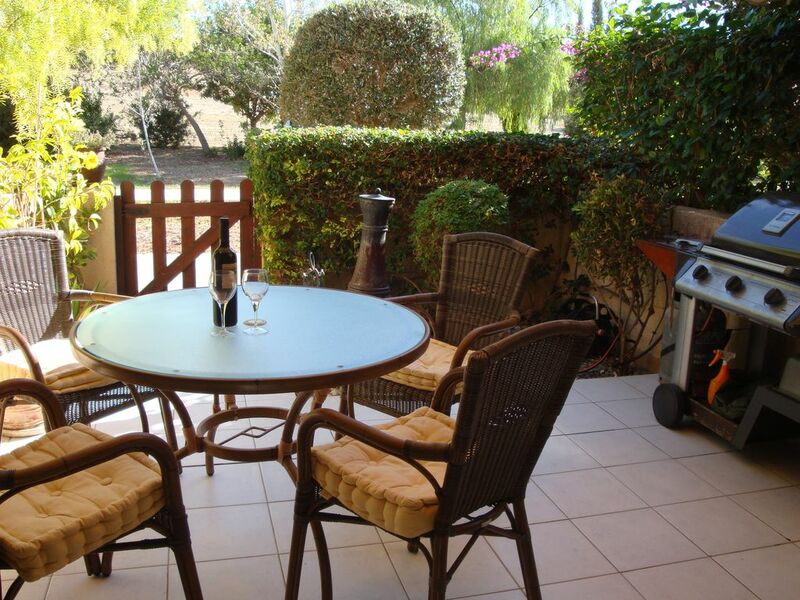 2 bedroom Townhouse in Polis Gardens with large communal pool. Free Gym/Sauna. The area is one of the most beautiful in Southern Cyprus, with a mountainous backdrop and miles of unspoiled beaches in the foreground. There is a lively growth of new shops and excellent tavernas serving fresh fish and delicious Greek food. Located on this quiet, flagship complex, this lovely, comfortable town house has quality gas barbecue and dining suite for alfresco dining, UK TV, high quality linens/towels, crockery/cutlery etc. DVDs, CDs & books are available for use during your stay. Strictly no smoking and no animals. Close to Polis Village and Latchi harbour and marina. Pomos Point and Harbour 15 minutes. Polis 5 minutes. Paphos 35 minutes Nicosia 2.5 hours. Step outside and walk just 10 metres to the magnificent communal pool area, with adjacent board-walk and children's pool there is also a play area to the rear of the house. The pool area, is surrounded by beautiful landscaped gardens. There are outdoor changing facilities & showers, poolside WC, an abundance of free sun loungers/parasols. It is always quiet with plenty of sun. All bedrooms have fly screens and shutters and the lounge has fly screens. Included in the rental is free usage of the on site fully equipped gym, Jacuzzi and sauna. Allocated underground car parking is included. This house offers all you will need for a very comfortable stay. Its just like a home from home. Uk Tv and internet is free with unlimited use. You have a lovely private garden leading out to beautiful green areas. There is a small on site park for the children and a gym for the grown ups, this complex is within walking distance to all the shops, bars and restaurants. Once you spend time here you will most certainly want to return. The heating is air con units and will be an extra cost. The pool is very large and all one depth. There is a small children's pool too. None of the pools are heated but are open all year long. This complex built by Pafilia developers has 4 phases that are all very separate and each phase has its own pool and sun beds/parasols. The complex is close to all the shops and other amenities. Its very well maintained gardens make the development look really lovely. It consists of town houses and apartments but no villas with private pools. In summer there is aqua aerobics and zumba in the gyn for all to join in for a small fee. It has a really friendly and welcoming feel to it as holiday makers make new friends and the children play together. A good location for visits up and down the cost for walks with lovely beaches within a 20 min walk or 5 min dirve. Cannot fault this property. Perfect location for us, small, undeveloped and low key, but plenty of restaurants and cafes. The property is very nice, with a choice of swimming pools and always a friendly face to say hello. A choice of sitting areas so you can always find some shade. Probably the best equipped property we have ever stayed in. Kim and Alan were fantastic and even came over to rescue our bbq. We had such a lovely time. Kim was so helpful and always at the end of the phone. Myself, my sister and both our husbands stayed in the property and both couples had plenty of space. We both had our own bathrooms and shower facilities which was perfect. The Satellite TV was a special bonus and had every channel you could imagine. We took full advantage of the washing machine and brought home suitcases full of clean clothes. It was so kind of Kim to leave us the Welcome Pack which provided us with breakfast on our first morning. There was a huge swimming pool with loads of sunbeds, also a smaller pool and you could use either. It is about a 15 minute walk into town, but very doable, where there are plenty of lovely tavernas to choose from. No complaints at all and are hopefully going to see Kim again soon. I would like to thank you for such a positive review, its very much appreciated and I'm sure will help future holiday makers when choosing a property. I would love to welcome you all back sometime in the future. The house is very clean and well maintained. Kim called to welcome soon after we arrived. The kitchen is well stocked with all the utensils you could ever need. There was a surprise welcome pack of bread, milk, butter, jams, water and even wine in the fridge. The chair and sofa in the living area were extremely comfortable, as was the double bed upstairs. We didn’t try the single beds but they looked to be of a good standard. There is a choice of 2 swimming pools close by. Neither were busy and the residents were friendly and gave us good advice about nice restaurants etc. There is underground parking, I feel as car is essential as while you can comfortably walk to the nearby supermarket and restaurants, it’s a bit far to walk to Latchi in the heat. We would definitely book this property again if we return to Polis. I hope you will also find this house a pleasure to stay in. We will always try to make our guests happy and comfortable. Your holiday is very important to us, we want you to feel relaxed and hopfully return sometime in the future. The house was way beyond our expectations, the standard of the complex has to be seen to be believed. We made use of the great BBQ at the back and enjoyed the views of the hills from the terraces, we practically had the pools to ourselves for our stay. Kim was great, we will be returning. I'm so happy that you enjoyed your stay at D1 and I would like to thank you for your positive review, I'm sure it will help future guests when making a choice for their holiday home. I look forward to meeting you both again sometime in the future. We were a party of 4 adults and this property was perfect. It is very well equipped and feels like a proper home. The rear terrace is very private and faces east overlooking a pleasant area of trees and shrubs with corn fields and hills beyond. It has a lovely awning shading the rear terrace. You can also sit at the front- so you can always sit in either sun or shade. Despite the fact this is a large complex, it was very quiet. There were two pools to choose from and a play area fir children under 10. The property was very clean on arrival and Kim was very helpful. Thank you! All in all a great place to stay. Thank you so much for taking the time to write a positive review. I'm sure your comments will help future guests in deciding where to stay. It was a pleasure to meet you all and I do hope you will return sometime in the future.